Well, there were lots of children there, but they were dressed to the nines in…real clothes. And he happened to be attached to my hip. All of a sudden, I was faced with a new and unexpected conundrum, the reality that a veritable spotlight was placed upon us as we made our way through the extremely crowded room, inside the ladies restroom and eventually back out, and up the stairs and across the mezzanine, accepting the compliments and the delighted stares of every. single. person. we. passed. 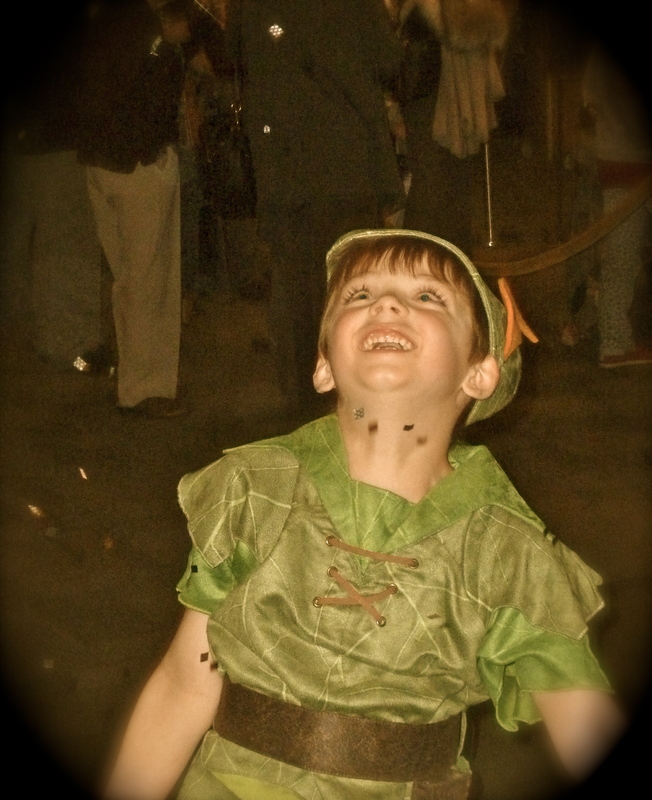 The children and senior adults we walked by were especially taken by my little lost boy, and Gideon received lots of waves from little ones even younger than he was, their mouths slightly hanging open to see Peter Pan right in their midst. You know, I always think I will enjoy the spotlight…until I’m in it. To say my cheeks were burning would be a bit of an understatement. “Why is everyone looking at me and waving at me?” Gideon asked me, and I wondered if, for the first time, my sheltered son might be realizing that not everyone goes everywhere dressed in costume. “Oh, I don’t know, Gid…” I responded with a small smirk on my face. “My name’s not Gid. It’s Peter.” he replied matter-of-factly. “Well…that’s why everyone is looking at you and waving at you. You’re Peter Pan!” I muttered. And then something even more unexpected happened to poor Mrs. Gore. Right there, standing in line to have our tickets scanned so we could enter the theater, with absolutely no warning whatsoever, Small Elephant decided to make an uninvited appearance. In other words, the impact of this meaningful night with my son hit me with full force, and a huge, dramatic, hormonally-charged lump began to form in my throat. I’m always sentimental. But when I’m pregnant…I’m a basketcase. And when it was Gideon’s turn to hand the attendant his ticket, and he stepped up like a big boy and held up his paper, a shy and excited expression on his precious little face, the lump in my throat grew unswallowable as tears began to burn at the back of my eyes. “Good grief, get a grip!” I furiously said to myself as I tried to take deep breaths and refrain from breaking down in front of an entire roomful of folks…folks who were already looking at us because of the bright green costume and matching cap (topped with a yellow felt feather). But then the elderly attendant looked down and saw that Peter Pan himself was handing her a ticket for the show and she smiled so big and said “Well, hello, Peter Pan!” before looking at me and beaming at the cuteness that was before her. Gideon smiled. My Mom chuckled. And I…Small Elephant…released some sort of manic, breathy laugh that was two seconds away from being a sob. Looking down, I pasted a smile on my face and continued to nervously giggle as I rapidly blinked away my tears, wishing that we could all just have a moment of silence to take in this moment without having the entire waiting audience watch Peter Pan’s pregnant mother have a meltdown in the mezzanine. It was one of the most wonderful and awful moments of my life. “Oh, I’m assistant to an OBGYN, so I see crying women all the time. We won’t even mention it.” the woman replied, leaning over her husband to get a better look at the pregnant spectacle next to him. Before too long, the lights thankfully dimmed, and the magic that is Peter Pan played out before our very eyes, and for the next two hours I was caught between the beauty of the story, the set, the costumes and the music, and the pure pleasure of watching my baby watch all of the above. Peter Pan is the perfect tale, is it not, for a little boy with an imagination and a heart as big as the sky, and I could kiss J.M. Barrie (or at least give him a thimble) for crafting a timeless story of boyhood that continues to resonate so deeply today, while beautifully paying homage to motherhood and family at the same time. Gideon belly laughed at every funny scene. He clapped enthusiastically after every musical number. And when he reached out and held my hand during the mother’s lullaby, those pesky tears gathered in my eyes once more as I meditated on the past 6 years, on all we’d been through together, and on how gracious is the God of the universe to give him to me and me to him. And, while it was a real treat to see the amazing Cathy Rigby in action (seriously…she cannot be 60 years old! AMAZING, and I told my husband that what she is able to do on the stage is much more impressive than if Peter Pan was actually real and could actually fly! ), I was very grateful that we were just far back enough that Gideon couldn’t see that she was, in fact, a woman. That just wouldn’t have gone over well a’tall. I could go into great detail about all of my favorite scenes, about the graceful and lovely Tigerlilly, about the fabulous and glittery pixie dust that was thrown all over the place, but I’ll just say that, of the many theatrical performances I’ve had the pleasure of enjoying over the years, this play was, by far, my favorite. Magical. Hilarious. Entertaining from start to finish. If you ever get the chance to see it, please do…and tell them that Mrs. Gore sent you. (I’m a favorite in Neverland, you know). At the show’s conclusion, my Mom and I took turns hefting Gideon up to see each of the cast members run out to take a bow and wave at the audience, and the huge grin on my son’s face and his wide-awake eyes at such a late hour told me that his first trip to the theater had been a roaring success. (I inwardly gasped. What a perfect way to end our night, and how fun for my little Peter Pan to have a real picture with the Cap’n as opposed to his Mama in a mustache). …OR, for $500 you could have your name entered into a raffle to win an opportunity to come back later in the week and fly with Peter Pan on stage. (I inwardly guffawed. $500. Ha!). (And I inwardly groaned. Thanks a lot, “Peter Pan”…you are now dead to me). “But I want to fly!” he pleaded, looking at the stage with longing. “Ohhhh…” he whimpered, and I hoped that the night hadn’t just lost some of its magic for him. 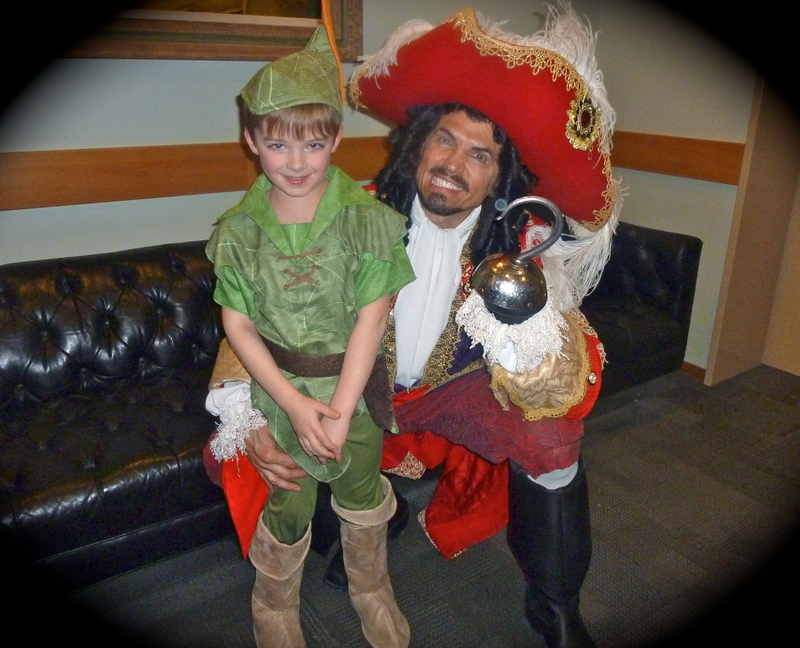 I laughed at his innocence, and Mom and I directed him to the line where Captain Hook was already taking pictures with his fans. “There’s Peter Pan!” I heard the Captain yell out as we walked by, pointing at us and waving. “Yep…” I thought, waving back, “we’re still here! Peter Pan and his Mom and Grandmother…” We continued to receive stares and waves as the lobby eventually thinned out, and my cheeks hurt from receiving and returning smile after smile. It was like prom night all over again. But the most difficult part of the entire night wasn’t trying to convince Gideon that we didn’t have $500 or finding the willpower to smile at passersby, but to keep my son from seeing Cathy Rigby as she autographed posters right across the room. “Where’s Peter Pan?” he asked as we continued to wait in line. “I don’t know…” I bald-face-lied, as Mom and I shuffled around to block his view of her. We had made it this far – he couldn’t find out that Peter Pan was played by a…a girl!…when we were so close to our departure! We all know that one lie always leads to another. But believe me when I say my hands were tied. Gideon just nodded. “Oh. Yeah.” Made perfect sense to him. and we flew back home to our nursery on the second floor where my little boy belongs. And I kissed his forehead and cupped his soft still-a-5-year-old cheek in my hand, memorizing his face, and this night, for safekeeping. “Sweet dreams…” I said, knowing that, tonight, they were almost guaranteed.